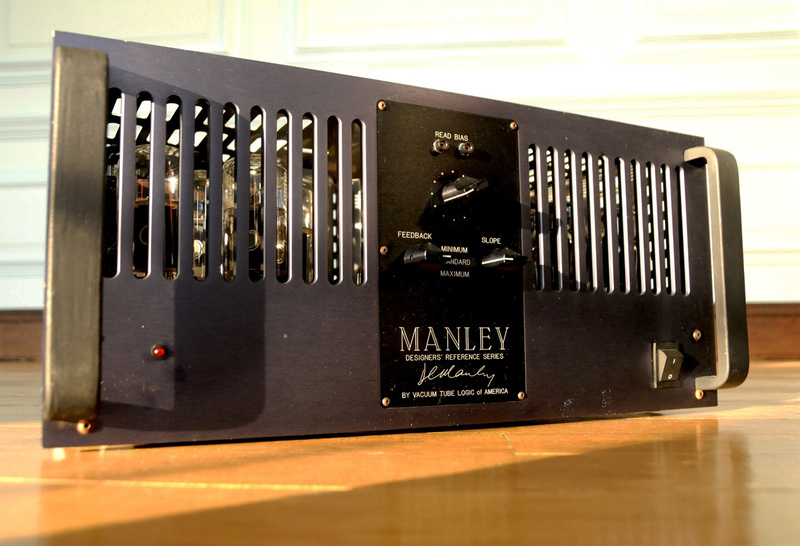 The Manley Reference 350 watt monoblocks were built at the old VTL factory back before the Manley-VTL split that took place in 1993. They were, at the time, Manley’s second-to-largest models in the Designer’s Reference Series. As 8-output tube designs, the 350′s were usually ultra-linear configured (although some units were fitted with triode-tetrode switching) and used either GE 6550A’s before 1990 or KT90′s after 1990. The Input tube was always the 12AT7A or 6201. Some early models used the 12BH7A for driver tube although most of the actual production models used 6350 driver tubes. Those two tube types have the grids and cathodes swapped on the pinout so make a big note that the 6350 and the 12BH7A are NOT interchangeable without reworking the circuit board. Flanking the driver tube there were two additional readout test points and an additional trimpot for the driver AC balance adjust. Manley 350′s have a sheet-metal chassis and stainless-steel covers. Cool features of these amplifiers include the adjustable “slope” and “feedback” controls that allow the user to select different feedback capacitive and resistive values respectively. Changing the capacitor in the feedback loop changes where the high frequency rolloff of the amplifier starts. Bigger capacitor will make the amplifier’s super-sonic roll off earlier. Also handy is the front panel mounted bias readout tipjacks and tube readout selector even though one still has to address the top deck of the amplifier to make the actual bias adjustments. Many of the later Manley 350′s had MIT-Multicaps. And some of them even had TRIODE / TETRODE switches. Both models ceased production in 1993 and were never manufactured at the new Manley Labs factory. Factory set for 100V, 120V or 220-240VAC operation for original destination country’s mains voltage. Shipping weight: about 80 lbs.